The above goes to support our thesis of last week that the article in Foreign Policy was not real news but a placed article. Journalism is often described as a noble profession. That reputation has been earned by a few instances in which journalists diligently pursued abuses by the connected & powerful. Watergate was perhaps the finest example. 1.Today’s Journalism & the Deep State – a servile or mutually rewarding relationship? But the day-to-day reality can be quite different. By its construct, journalism can easily degrade into a parasitic activity especially when reporters cover the same institution for years. We see that daily in financial TV coverage of the US Federal Reserve. Dedicated Fed reporters become dependent on the Fed for access to the Fed Governors & their TV networks increase viewership by getting prominent Fed governors to appear on their TV networks. And soon enough, this mutually beneficial arrangement converts financial reporters into virtual spokespeople for the Fed, often at the cost of inflicting damage on the network’s viewers. This we know & keep seeing every day. But what about secretive organizations inside Government? At least the US bond market provides enough clues & information for viewers to become wary of the so-called reporters who cover the Fed. But viewers & readers have no way of knowing which reporters & which media organizations are virtually spokespeople for major US government agencies. We can’t tell whether the anonymous sources quoted by these reporters are true & credible sources or they are merely deep state operators using reporters to spread misinformation. This deep state system of using reporters to spread information & the reporters benefiting from it reached a crescendo during the recently completed Mueller probe of President Trump. We all saw newer & juicier “reports” from previously credible news entities that implicated & sometimes accused President Trump of un-presidential & occasionally impeachable activities. Now, after two years of journalistic mayhem, we all know that the enormously expensive effort was for naught. Special Counsel Mueller found no wrongdoing by President Trump. If this is not enough, the news media itself has morphed into political activism. Instead of honestly reporting facts, newspapers & TV networks have morphed themselves into virtually making them up. So we now have a deep network of reporters, news organizations & a collection of deep state “sources” all working towards political objectives instead of even keeping up the pretense of honest reporting. Then we have a strange coincidence. Media entities that are anti-Trump are also anti-Modi and by extension anti-India. This may be more than a coincidence but that is a topic for a later discussion. Today we discuss a “news” report of this week that, in our opinion, combines all of the above. Based on reading articles published by Foreign Policy Magazine, we came to a conclusion some time ago that it is a dedicated anti-India magazine. The nadir was reached when this magazine named Arvind Kejriwal as one of the top intellectuals in the world after he won the Delhi elections. Any one who knows anything about Delhi politics would now recognize the brazen stupidity of that selection. But it was not stupid. Because the magazine, in our opinion, is intensely anti-Hindu and thus disliked PM Modi. So Kejriwal’s victory in local Delhi elections seemed to them an opportunity to build up a rising anti-Modi politician. The elections in India begin next week and everyone realizes that PM Modi has an uphill battle ahead. The recent military strikes against NPak have enhanced his image and popularity considerably. Apart from the air strike against Jaish-e-Mohammed terrorists inside NonPakistan, a MIG-21 fighter of the Indian Air Force shot down an F-16 fighter flown by the NPak Air Force in a large dogfight. The Indian MIG-21 was also shot down, The pilot of the MIG-21 landed in NPak occupied territory & was held by NPakistan. PM Modi demanded the release of the pilot and, with significant pressure applied by the Trump Administration, the pilot was released. This further enhanced PM Modi’s popularity & his electoral prospects. Now this week, just a week before the election, Foreign Policy Magazine published an article by a reporter named Lara Seligman, disputing the shooting down of the F-16. The article merely quotes two anonymous US defense officials saying they have counted all F-16s given to NonPakistan & found none missing. The two US defense officials are neither named nor are any numerical figures provided. The reporter seems to have done no work to validate either the sources or the figures. She has merely taken whatever she was told and reported it as gospel. Actually, there is no evidence to prove that she was actually told anything or that these two defense officials actually exist. This is the most brazen assertion of “white privilege” that we have seen. We are supposed to take the word of a “white” reporter about third world “brown” India from a demonstrably anti-India magazine about statements she claims were made by two anonymous defense department officials. The US reconnaissance abilities are second to none and, because of the US presence in Afghanistan, the US military maintains intense surveillance of the airspace in which the dogfight took place. But neither the reporter nor the Foreign Policy Magazine seem to have checked with the US military to see what evidence they have of the dogfight. Did the reporter or the magazine speak to the Indian Air Force & ask for an explanation? Not according to the article. Major Gaurav Arya (Retd)‏Verified account @majorgauravarya – For America, war is a multi-trillion dollar business & the F16 is a global brand. There is no way the US can ever admit that a MIG 21 shot down an F16. It will bury the brand for ever & will raise questions on other US weapon systems. Embarrassing for US. Actually it may be deeper than that. Lockheed is intensely marketing the F-16 (now renamed as F-21) to the Indian Air Force to replace their ageing 100 or so MIG-21 fleet. Admitting that a MIG-21 shot down a F-16 would be tantamount to killing that entire effort. And the F-16 forms the backbone of the air forces of US Allies. They have to be reassured that their F-16s could never be shot down by a third-generation MIG-21s flown by their enemies. For two years now, the entire mainstream media has been focused on [now demonstrated as false] collusion between the Trump Administration & Russia. So anything positive about Russia is deemed evil. And NonPakistan Air Force is still deemed as a “friend” in sections of US Defense establishment and a buyer of F-16s while the Indian Air Force is deemed unfriendly because of historical purchases of Russian aircraft. Did all these factors come together to launch an unverified, anonymously sourced “story” about an unverified, undisclosed count of F-16s in the NPak air force? We don’t know for sure. But that seems probable to say the least. It is important to note that the Indian Air Force held an hour-long briefing for journalists & reiterated their claim about shooting down a NPak-flown F-16. But they have not released any details just as the US Military did not release any details of the raid against Bin Laden. Releasing AWAC & Satellite images can possibly reveal military secrets and so most militaries don’t do so. Possibly a few years later, a film might made about both the Balakot airstrike & the dogfight like the Zero Dark Thirty film about the raid against Bin Laden. Vishnu Som‏Verified account @VishnuNDTV 1. In a briefing lasting more than an hour, senior IAF officers briefed journalists on why they insist Wing Commander Abhinandan shot down an F-16. I was there. Unlike the detail-less Foreign Policy Magazine article by Lara Seligman, details about the dogfight have been pieced together & published by analysts. Below are a couple of such that seem credible to us both because of the details & the reputation of the analysts. One such is Sameer Joshi (@joe_Sameer). What is his background? Vishnu Som‏Verified account @VishnuNDTV Apr 1 Sameer Joshi is a former Mirage 2000 pilot, Kargil war vet, tech developer, satellite imagery expert and as versatile an OSINT observer as you will find anywhere. For weeks, he has been piecing together details of the India-Pak air battle. This is the most authentic detail yet. 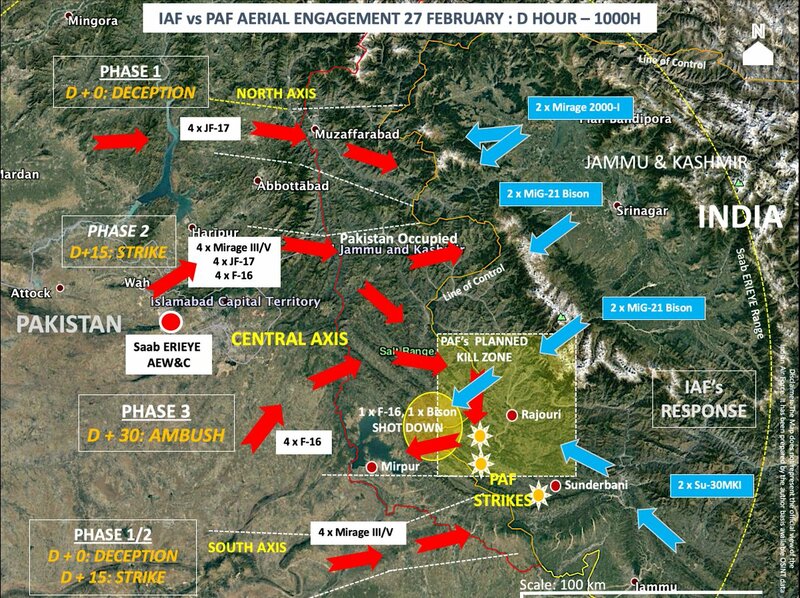 Sameer Joshi‏@joe_sameerApr 1 – The Indian Air Force fought one of its most significant post-independence aerial clash with the Pakistan Air Force on 27 February 2019. This graphic is the most authentic sit rep on the attack axis, force packages and geographical locations of the engagement. Apparently the objective of the NPak Air Force was to shoot down one of IAF’s front-line Sukhoi fighters as a trophy win. Instead they ended up trading an F-16 for an old MIG-21. 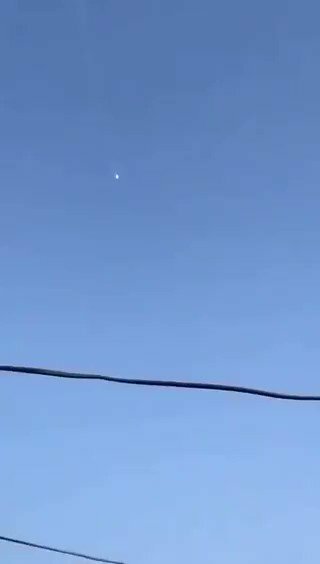 Below is a tweet & video about the parachutes from Nitin Gokhale, a veteran defense journalist and the editor-in-chief of Strategic News International. Notice that the thread by Sameer Joshi is dated April 1 while Lara Seligman’s article in Foreign Policy is dated April 4. So the question arises whether Ms. Seligman did even the most cursory due diligence of checking on Twitter or checking with any sources in India. The next question is whether the editor at Foreign Policy Magazine asked Ms. Seligman to check/verify her “scoop” with sources that any one could find. The answer to both seems an emphatic No. That leads us to conclude that Ms. Seligman’s article in Foreign Policy Magazine was NOT a reported article but an article PLACED there by some interested parties, deep state or otherwise. Finally, watch & listen to the discussion about the above dogfight between Nitin Gokhale and Former Air Marshal Sinha (AOC-in-C Central Air Command). Had Marshal Sinha not retired, the above dogfight would have been under his command. The clip included comments about AWAC signatures & radio signatures of all fighters involved in the dogfight. We don’t know what prompted Lara Seligman & Foreign Policy Magazine to accept the “Placed” article from those who wanted it placed. Perhaps they achieved their short term interests of possibly hurting PM Modi in the election or reassuring their decades-old friends in the NPak military or reassuring middle eastern allies about the F-16. But we do know that the article has sown further mistrust in Indian minds about American motives. Both USA & India have struggled to overcome 5-6 decades long customer-buyer relationship between NPak military & American defense companies. This seemingly placed & spuriously sourced article can only hurt that cause. Fortunately both the Trump Administration and the Modi Government are committed to the new & evolving US-India Strategic Partnership. They both will manage any damage caused by this unverified, unconfirmed article in the Foreign Policy Magazine. And the most important relationship is between the US & Indian Navies in the Indo-Pacific where the most critical defense objectives of the two countries coincide. In the tradition of this Blog, we will ask both Lara Seligman & Foreign Policy Magazine to tell us where we might be unfair or inaccurate in our comments about their article. We will be happy to print their non-private response verbatim. Editor’s PS: We also recommend watching the video below by Air Marshal (Rted) KK Nohwar, former Vice Chief of Air Staff. The details & the demeanor speaks to his capabilities & balanced judgement.